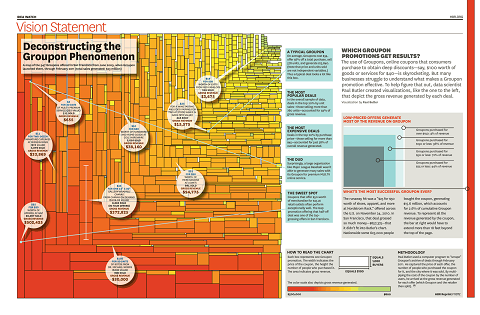 A version of my Groupon visualization appears in the latest Harvard Business Review. At the suggestion of their editorial and design staff, I re-did the visualization to focus on a smaller subset of the data: deals in San Francisco. I must give the HBR staff a lot of credit for the final product — they made a visualization designed to be interactive work in print.